On art, music, books, movies, politics, life - sometimes with astrology thrown in. Joe South (born Joe Souter) has a birthday tomorrow - his 72nd. 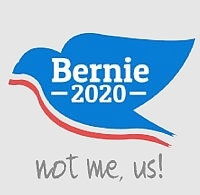 I remember him only from his 1968 hit song, and its interesting and ever-relevant lyrics: The Games People Play. The song's title was taken from a book by Eric Berne, a bestseller on the psychology of human relationships. 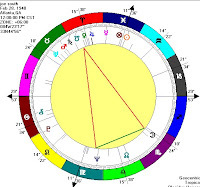 By the way, there's a cynical mention of astrology in these lyrics: "read your horoscope........"
As well as being a sought-after sessions musician - played guitar on some iconic albums: Bob Dylan's Blonde on Blonde, Simon & Garfunkel's Sounds of Silence, and tracks by Aretha Franklin, Marty Robbins and others - he wrote many successful songs for other performers. He composed Billy Joe Royal's Down in the Boondocks, Lynn Anderson's huge hit I Never Promised you a Rose Garden, Deep Purple's Hush. His style was a mix of country, pop and southern soul, but his songs aren't the feel-good self-congratulatory ditties, which were fairly common back then. There's more than a hint of bitterness, social commentary and some hostility embedded in them. 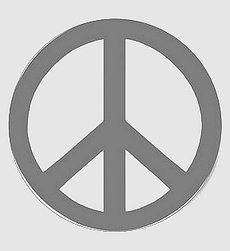 One reviewer wondered whether his apparent political stances were blocking the way to wider success; his mindset seemed more in line with hippie thinking than southern country conservative. After success with Games People Play Joe had a few more hits including Walk A Mile In My Shoes, Don't It Make You Want to Go Home; but in 1971 his brother Tommy, troubled by drug addiction, commited suicide. Afterwards Joe left the music business for many years, went to live in the jungles of Maui in the Hawaiian islands. He later returned to music, but mainly publishing rather than performing. 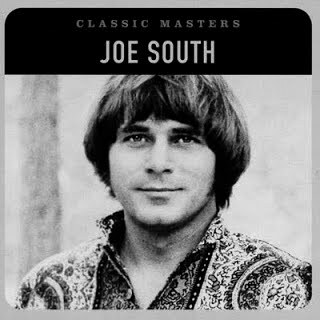 Writers of articles online describe Joe South as having been a better performer in the studio than on stage, where he was never totally comfortable. Prickly, antagonistic, brash, arrogant, or anxious are adjectives used to describe him. I can find no time of birth for him, so Joe's chart is set for 12 noon. Moon would have been somewhere in the second half of Scorpio whatever his time of birth; rising sign will remain unknown. 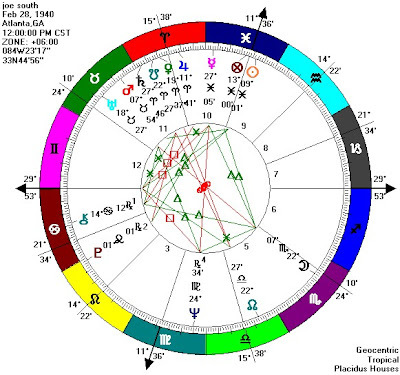 Sun and Mercury in gentle, emotional Pisces, Moon in Mars-ruled occasionally paranoid Scorpio, with three personal planets, Jupiter, Venus and Saturn, in the other Mars-ruled planet, Aries - a combination that isn't exactly built for comfort! That mixture could well account for Joe South's reportedly "prickly" nature. 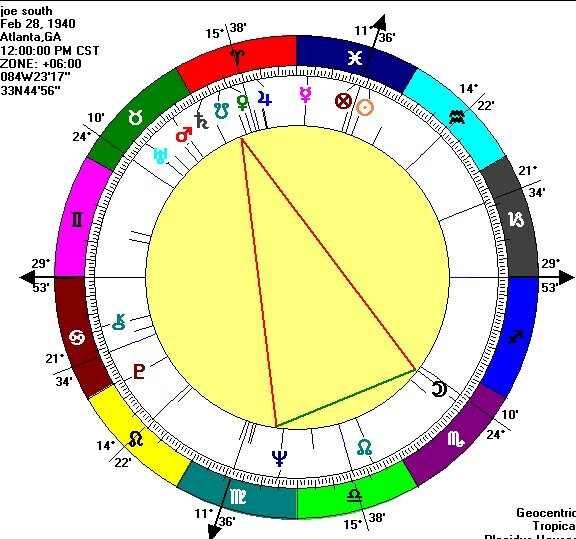 In spite of barbs though, the gathered wisdom of 12th sign Pisces, last of the line, shines through his songs, especially Games People Play. 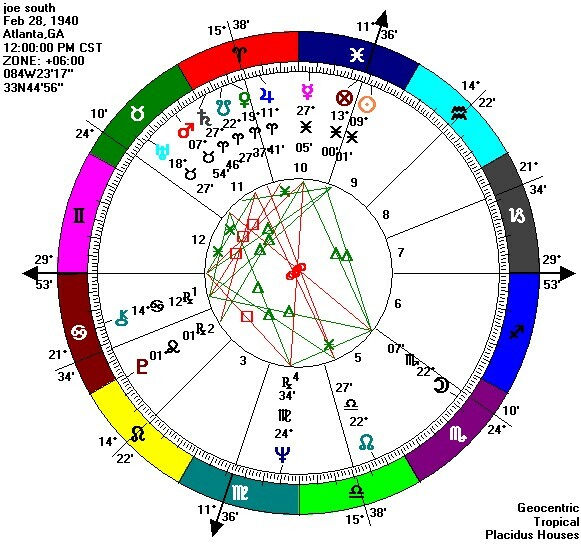 Without a birth time I can't be sure about this, but I suspect there's a Yod (Finger of Fate) in his chart, involving a sextile (60*) from Moon to Neptune, both planets linking to Venus by 150* quincunxes. Such a configuration would link creativity from Neptune to emotion from Moon, funnelling out via Venus planet of the arts. 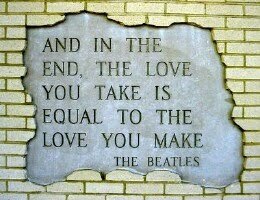 Matches a singer/songwriter/musician exactly! I had no idea he had other hits as well as that, T. Thanks for the informative post, I learned more about him! It was a long time ago, WWW ! I was surprised that he'd weitten Lynn Anderson's Rose Garden hit. I like Eric Berne's book "Games People Play". Vanilla Rose ~~ I haven't read it - but if I ever see it in a used book store on our travels, will buy it - it sounds interesting. Also answers to Ann or Annie or even Twilight Annie (sounds like a character from Dickens - or Damon Runyan!) British-born, living in the USA since 2004, US citizen since 2008. 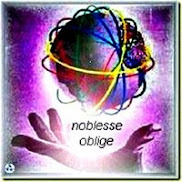 Self-taught non-professional dabbler in astrology, which took up most of the blog-space here from Aug. 2006 to Aug. 2012. 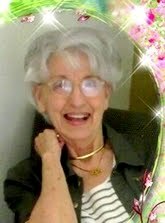 The blog now covers more general topics, along with occasional astrology- related posts. Archives can be accessed easily via links in the sidebar. Arty Farty Friday ~ Ansel Adams ~ Pisces Again. LOUIS CHEVROLET ~ "Never Give Up"